Of all the inept reasons to be bullish about equities, "beat the street" hype is near the top of the list. The fact is, in aggregate, ever since Reg-FD (full disclosure) companies always beat the street. I just happen to have one, with thanks to Understandings Earnings Estimates by James Bianco on the Big Picture Blog. If this "beat the street" talk was not pathetic enough in and of itself, the fact remains that sentiment, not earnings, is the key to stock market performance. I discussed this concept at length in a pair of posts earlier this year. Please read those posts if you have not yet had a chance to do so. On June 20, in Value Traps Galore (Including Financials and Berkshire); Dead Money for a Decade I noted Berkshire, Citigroup, and Bank of America were "value traps". At that time Citigroup had a price-to-book valuation of .64, and Bank of America a price-to-book valuation of .50. Citigroup Price-to-Book valuation is now .52 and Bank of America Price-to-Book Valuation has fallen to .38. Those who thought Bank of America was cheap at book value, now find themselves 62% in the hole. I suspect they may still be in the hole 10 years from now. Stocks that look cheap can always look cheaper. 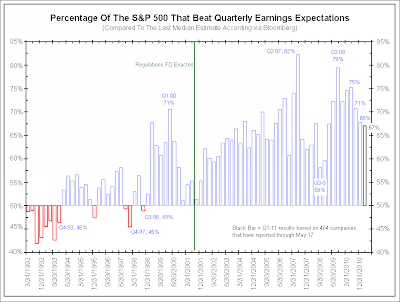 It is important to recognize that the S&P 500 is presently only about 13% below its April peak, and the word "only" deserves emphasis. Our valuation impressions align fairly well with those of Jeremy Grantham at GMO, who puts fair value for the S&P 500 "no higher than 950" - a level that we would still associate with prospective 10-year total returns of only about 8% annually. I would consider investors to be very fortunate if the market does not substantially breach that level in the coming 12-18 months. Wall Street continues its servile attachment to forward operating earnings, seemingly unconscious that the perceived "norms" for the resulting P/E are artifacts of a bubble period. The fact is that historical periods of overvaluation and poor subsequent long-term returns correspond to forward operating P/E multiples anywhere above 12, while secular buying opportunities such as 1950, 1974 and 1982 map to forward operating multiples of only 5 or 6 (based on the strong correlation but downward-biased level of forward operating P/E ratios, when compared with multiples based on normalized earnings - see Chutes and Ladders for a graphic). Without question, one of the notions buoying Wall Street optimism here is the hope that the Fed will pull another rabbit out of its hat by initiating QE3. That's a nice sentiment, but it does overlook one minor detail. QE2 didn't work. Actually, that's not quite fair. The Federal Reserve was indeed successful at provoking a speculative frenzy in the financial markets, which has now been completely wiped out. The Fed was also successful in leveraging its balance sheet by more than 55-to-1 (more than Bear Stearns, Lehman, Fannie Mae, Freddie Mac, or even Long-Term Capital Management ever achieved), and driving the monetary base to more than 18 cents for every dollar of GDP. The Fed was indeed successful in provoking a wave of commodity hoarding that affected global supplies and injured the poorest of the poor - particularly in developing countries. The Fed was successful in setting off a very predictable decline in the value of the U.S. dollar. The Fed was successful in punishing savers and the risk averse, and driving investors to reach for yield in risky investments that they would normally avoid were it not for the absence of yield. The Fed was successful in provoking those with strong balance sheets to pay down existing higher interest-rate debt, and in creating an incentive for those with weak balance sheets to issue more of it at low rates, resulting in a simultaneous deterioration of credit quality and compensation for risk in the financial system. Hussman's article is well worth a read in entirety. In terms of expected annualized returns, I think Hussman is a bit too optimistic over the long-term even though I endorse his intermediate-term philosophy "I would consider investors to be very fortunate if the market does not substantially breach [S&P 950] in the coming 12-18 months." Tobias Levkovich, Citigroup Inc. (C)’s chief U.S. equity strategist in New York, forecasts the S&P 500 will end the year at 1,400. Brian Belski, the New York-based chief investment strategist at Oppenheimer & Co., estimates the S&P 500 will reach 1,325. Barry Knapp, the New York-based chief U.S. equity strategist at Barclays year-end projection is 1,450.
Credit Suisse Group AG (CSGN) and HSBC Holdings Plc (HSBA) advised investors to buy equities today. Andrew Garthwaite, a London- based strategist at Credit Suisse, reiterated an “overweight” recommendation on stocks even as he cut his year-end forecast for the S&P 500 to 1,350. 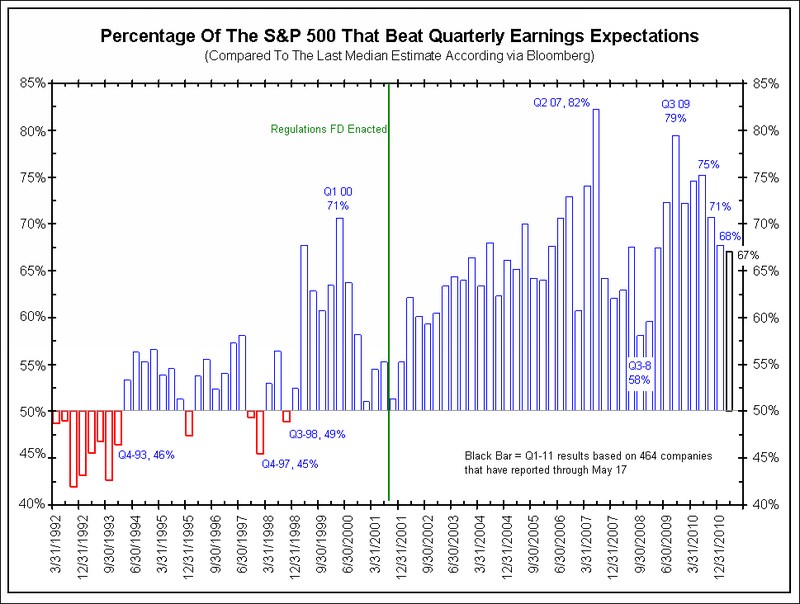 Nearly anything is conceivable, but I think fiscal and monetary stimulus has run its course and earnings will plunge. The Eurozone is heading for a recession or in one. China is slowing. The UK is in recession or headed for one, Australia and Canada, same story. In spite of denial by analysts, the US is on a recession track if not in one. Moreover, judging from the unemployment rate, corporations are running pretty lean here. If profits plunge, it will be tough to cut a lot of employees to make up for revenue shortfalls. Implications are severe either way. One affects job, the other earnings. The US can easily take a hit both ways. Capital shortfalls are not unique to Bank of America. For the current sorry state of affairs of the banking system, please see BNP Paribas leveraged 27:1; Société Générale Leveraged 50:1; Global Financial System is Bankrupt. With this backdrop, I fail to see how earnings can't plunge. But hey, look on the bright side: companies will still "beat the street". They always do.